Is your To Do list endless? Do you have too much to do and not enough time? 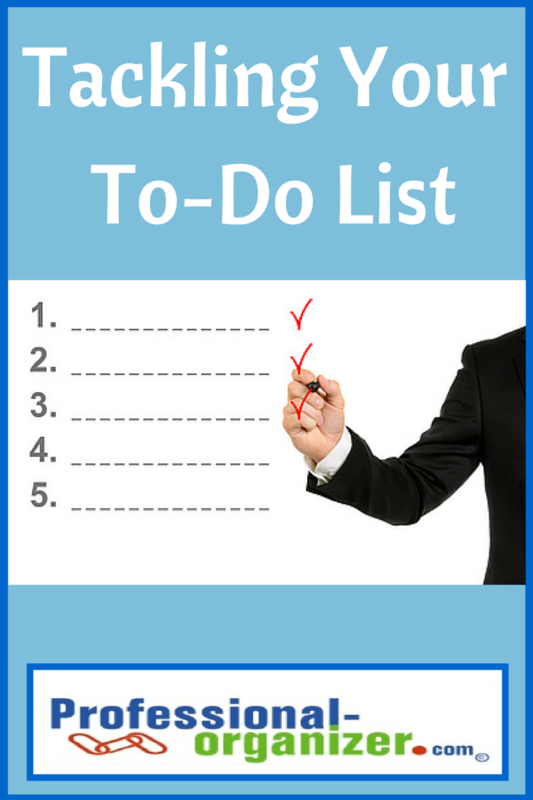 Tackling your To Do List doesn’t have to be overwhelming. Here are a few tips and tricks to knock out your list. Start with a great way to make your list. There is too much to remember to keep your list in your head. There are many ways to create your list. A small spiral notebook you can carry with you makes a great spot to record actions. You can use post it notes, writing one task on each note, and post them on a wall or window. Apps like Remember the Milk, ToodleDo and Wunderlist keep your list on your smart phone. Whatever your tool, writing and recording a list helps tackle your tasks. Be specific on your list. Write in the one next step. Like David Allen recommends, be sure your list includes actionable items. It’s the one next step that will move you forward on that project, rather than the project itself. Prioritize what’s on your list. Establish 3 Most Important Tasks (MITs) each day. What’s most important may be a task with a deadline or the first step of a long term project. You may not be able to complete your entire list, but you have started on what’s vital. Do the one most important task first. Life is complicated and unreliable. Remember that quote about eating dessert first? The only thing you can count on conquering in a day is the task you do first. This also requires you to put aside email until after you have completed a task. Stay focused with a timer. Set your timer for 15 – 30 minutes and work on a single project at a time. Research shows multi -tasking diminishes our productivity. You will be surprised at how much you accomplish when working on a single task at a time. A timer can be used at home, at the office, with your family or on your own. If you are feeling overwhelmed at home or at work, spend a few minutes making and prioritizing your To Do List. 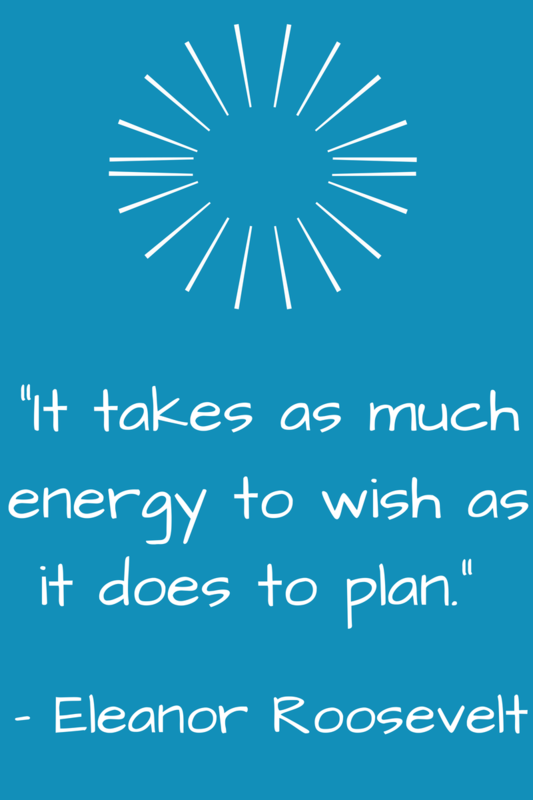 Starting your day with a plan makes all the difference in feeling effective and productive. Join me on my Powerful Productivity pinterest board. You’ll find lots of tricks, tips and tools for making your day more productive. Have you decided that there is too much paper in your home or office? Thinking about making a small change with paper in your home or office? Are you thinking about going paperless? There are several small steps you can start. 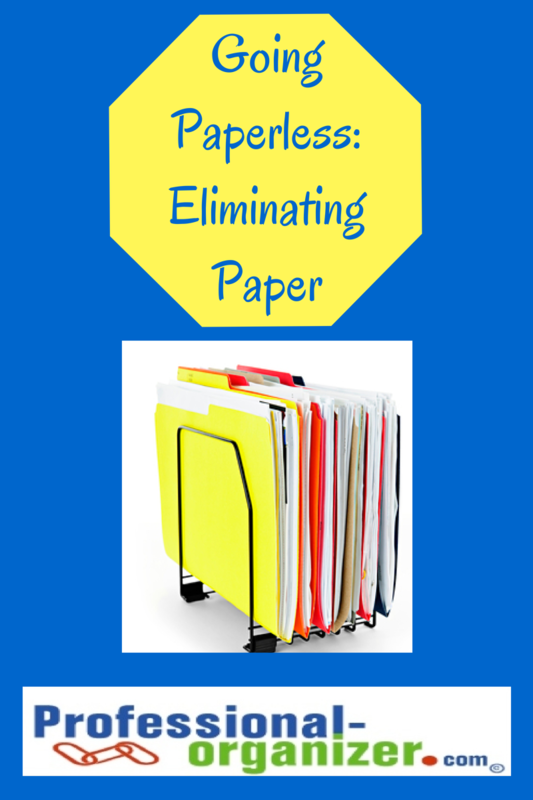 Eliminating paper that comes into your home or office is a great first step. Transitioning paper immediately into a digital format is a small step in eliminating paper too. Create a free account and select the catalogs you receive. Set up an account with your health care provider for online access to your explanation of benefits from your medical insurance. Set up online banking for your checking, savings and investment accounts. Save the PDF version in a Banking (by year) folder. Are there lots of post it notes, backs of envelopes and other bits of paper around? Set up an Evernote account to record these. You can even take a picture of the paper and tag it in Evernote. Going paperless does not happen overnight. But with small, consistent strategies and tools you can have less and less paper! Let’s connect on Twitter. It’s where you can ask questions about organizing and productivity. A once a month boost of organizing and productivity! Join my newsletter. 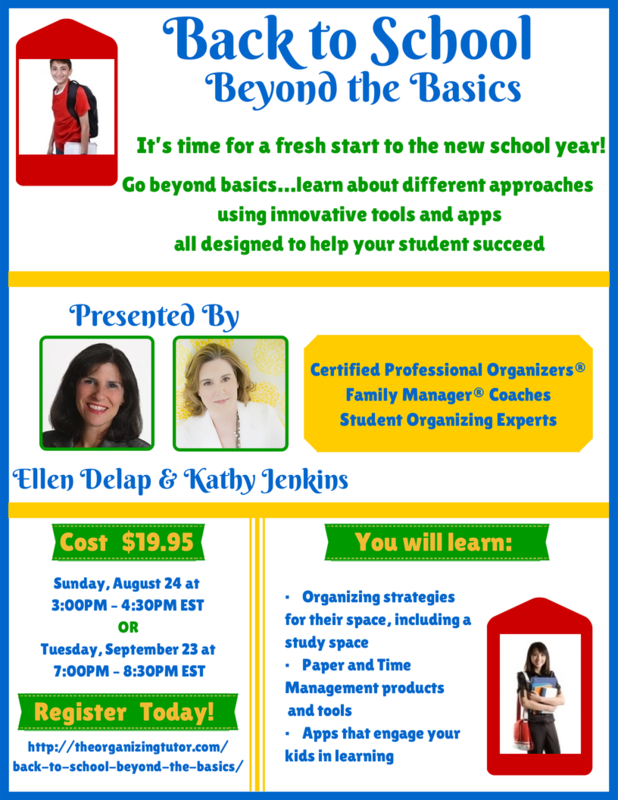 https://professional-organizer.com/WordPress/wp-content/uploads/2016/07/logo.png 0 0 Ellen https://professional-organizer.com/WordPress/wp-content/uploads/2016/07/logo.png Ellen2014-08-17 19:38:112014-10-07 07:26:38"It takes as much energy to wish as to plan"
As funny as it sounds, a productive day starts the night before. Why? Because mornings are crazy and people are cranky! There’s no time when you accidentally get up late because you or your family hit snooze. 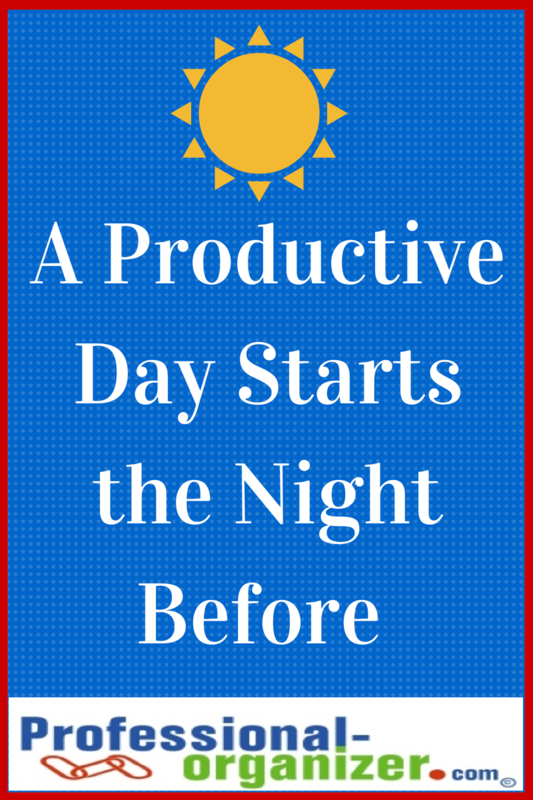 The key to productivity is setting yourself up for success the night before. What are essential tasks that need to be done for the next day? Make a check list for you and your family to be sure these are done at night. Post the list where each person can see it, such as a bathroom mirror. Your list can include a spot for check marks too so you are sure you completed each step. Getting a great night’s rest starts by getting ready early. Start your kids’ off at an earlier bath, story and bedtime and you will enjoy a few minutes of extra solitude. Get in your jammies way ahead of time or no later than an hour before bed. Plan on 7 – 8 hours of rest for everyone. Set your alarm and you will be surprised at how great you feel the next day. Now is the time for you bedtime procrastinators to get great shut- eye. Get buy-in from your family with a family meeting. Talk about the value of a great night’s rest and working together to have a great day. Kids can help pack lunches. Have a laundry party to get everyone to take their clean clothes back to their rooms. Make dinner super simple so there are no dishes. No team? Use technology, automation and other delegation to help. This could be buying precut fruits and veggies, using reminders on your smart phone, or dropping your dry cleaning off each week on the same day. Getting started the night before allows for the “oops” factor. Some thing may go wrong in the morning. But you have it covered if you start the night before. 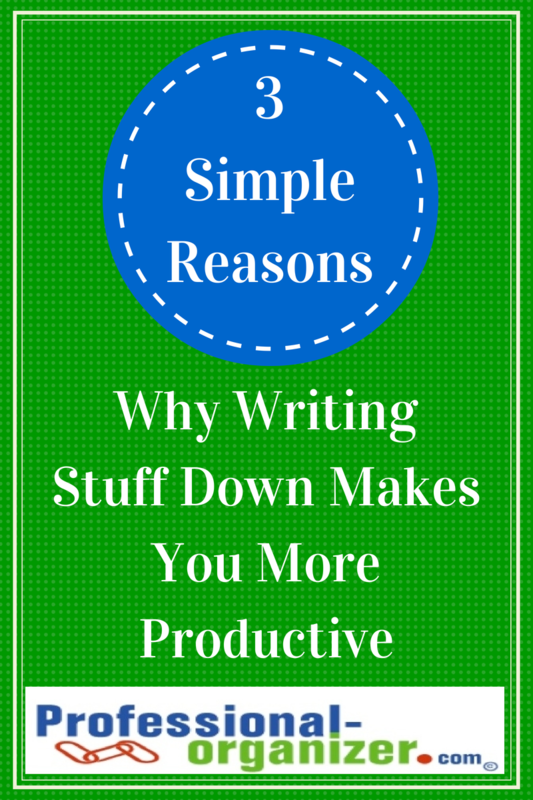 Love organizing or productivity tips? Need a monthly boost to stay on track? Join my newsletter! Remember when life was so simple we just had to remember one telephone number to chat with a colleague, family or friend. Just 7 simple digits and we chatted directly. Now we have 2 or 3 numbers per person to remember. But we still think we can remember it all! For me it’s always been natural to write stuff down. Ever since I can remember, I had a small notebook to write down details. If it’s not so natural to you, there’s lots of reasons to start. In the book, Write It Down, Make it Happen, author Henriette Klauser notes that when you write down your goals and dreams, these become reality. When my clients find old notes, they see that they have often finished tasks and accomplished goals. For many of us, writing helps us embark on our work. It helps clear the fog in your head. It can help you process and break a task into smaller, manageable units. Once written, you can prioritize and filter out the more essential tasks. Michael Hyatt refers to writing stuff down as the “secret to accomplishing what matters most to you”. So now you are ready to start? Or maybe you already write stuff down, but on post its, envelopes and the back of paper plates. Here are some great options for WSD to help you consolidate and organize your notes. For each of these options, you can create a category and put your note where you will find it again too! Now’s the time to give your brain a break and get started. What option will work best for you? What other apps or tools help you write stuff down? Don’t miss out on productivity tips, tools and tricks ~ join my newsletter. Your kids just got out of school and it is already time for Back To School. It’s hard to get started, so I have created this series Quick Start Back to School to get everyone going! The next post is about Back To School routines. For many families the thought of Back to School routines strikes a negative chord. For some families, they welcome back the thought of getting back into the structure of the school year. Adding just a few times for routines makes a difference for all families. Starting a week before school starts, inch back bedtime to just 3o minutes before school time bedtime. Creating a consistent bedtime helps everyone get a better night’s sleep. Start extra early to allow for conversation. It may not be dark yet, so adding a soothing sound can help too. 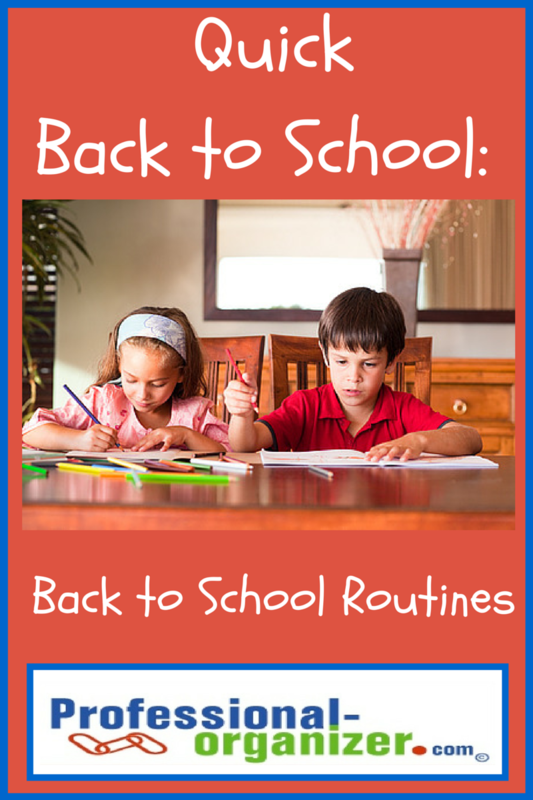 Once school starts, have a routine that includes bath, reading and bed. Eliminate all blue light devices at least an hour before bedtime. Parents need a bedtime too during the school year. Be realistic about the amount of sleep you need. Sleep procrastination for parents can be a real problem! Homework should have a start and finish time. Once your kids hit the door, have a snack and start by 4pm. The early start means homework ends before dinner. Use a timer to get your kids started and work in 15 or 20 minute intervals, with 5 minute breaks (known as the Pomodoro Technique) for best focus. Homework ends when everything is tucked back in the backpack and by the landing strip. This spot can be at the entry where you head to the car. Your purse, laptop and any other items should be ready to go in the morning too. Family meeting time is an important communication and team building time. It’s when everyone posts to the family calendar, talks about upcoming events and shares time together. Be sure to decide when you will meet and you will truly be amazed at the benefits. Grocery shopping makes it easier to prepare family meals, healthy snacks and lunches for school. Set a weekly time to shop and decide on how you will create your list. A magnetic list is great and so is the app GroceryIQ. If your family is struggling, create a check list on a dry erase board to help them keep on top of their responsibilities and routines. Join my newsletter for a monthly boost of organizing energy!